Thanks in no small part to the rise and rise of The Great British Bake Off, much of the population (who are we kidding, the entire population) has been increasingly gripped by baking fever. It doesn’t matter whether you’re an absolute beginner or an Aga-whisperer — with the help of our favourite decorating tools and cake decorating sets, you’ll be earning your spot on the gingham altar in no time. Our pick of the best tools for baking ranges from the very basics, like nesting mixing bowls, measuring spoons and spatulas (well, ‘spoonulas’), to feats of structural engineering allowing you to make the likes of gravity and waterfall cakes. There are sets boasting all the tools you need to make sculptural masterpieces, patterns and motifs, including double-ended detailing tools and pretty flower punchers, and those with pro-looking icing bags and nozzles for a pocket-friendly price. And then, there’s the last-minute pretty bits, perfect for making maximum impact at the party buffet table or school bake sale with the minimum of time and fuss: gel colours for perfectly textured buttercream atop your best cupcakes; edible glitter for an ultra-glam finish; and beautifully illustrated cupcake toppers for cutesy factor. It’s all here, so what are you waiting for? This colourful measuring spoon set, plus two mixing bowls, makes a great gift for baking-mad students, stocking them up with everything they need to put their signature spin on their favourite bakes. The measuring cups also come in incredibly handy for a range of dishes, very useful for starter cooks who don’t feel comfortable eyeballing ingredients, and the clever nesting design saves space in the cupboard. An all-round win. With a whopping 42 options, this icing nozzle set is a must-have for any keen cake decorator. 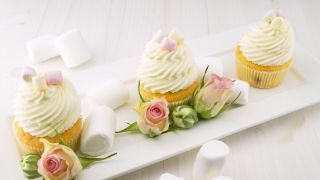 The two reusable silicone piping bags save on waste from improvising with greaseproof paper, the stainless steel tips are durable and easy to clean in the dishwasher or by hand, and the selection of icing tips is second-to-none, allowing you to experiment to your heart’s content. Batter lurking between paddles and in the bottom of bowls? Spoonula to the rescue. You might not think it, but amazingly, finding the best spoon for baking can make all the difference, and we think we’ve got it right here. The ProCook silicone spoonula has a thin end and flexible paddle that’s perfect for scraping the last bit of cake batter into the pan, but sturdy enough for heavy mixes too. And, as it won’t scratch, you can use it with non-stick frying pans for general cooking tasks. This 50-piece cake decorating set goes for quality and quantity with its well-built range of tools to suit every need. Reviewers had a universally positive experience with this high-end-feeling set boasting double-ended tools, cutters, icing smoother and non-stick rolling pin, so for us, that makes it a must-have for anyone who works with royal icing. The budget price means it doesn’t even have to be reserved for seriously experienced bakers, either — treat yourself and get experimenting. For creating on-trend ombre cakes or cute and colourful rainbow cakes, make this set of five pans your go-to helper. While reviewers were initially nervous of the small diameter, they all agreed that the resulting cakes were hugely impressive, and that the non-stick tins made for easy release even when they forgot to grease. Plus, being able to cook up to five layers at the same time rather than having to wash and reuse the same pan eliminates the guesswork for a nice, even bake that Paul and Prue would be proud of. How to make anti-gravity cakes? With a supporting role from this clever kit, of course. The secret to making anti-gravity cakes is revealed in this clever do-it-yourself kit from Lakeland. With Lakeland’s helpful instructions and online video for reference, use the clip-together supporting rods and sturdy base to make a showstopping illusion cake centrepiece for your next party or work bake-off that’s sure to impress. Trust us, it’s easier than it looks, but this kit might still be best reserved for more experienced bakers. Perfect for Christmas fetes and holiday bakes, these super-sparkly edible glitters come in four festive shades of red, green, silver and gold to add a touch of magic to snowy Christmas cake scenes and much more besides. The pierced cap makes it easy to shake out just the right amount, so you can get the kids involved in the baking fun without fearing the inevitable avalanche of glitter.